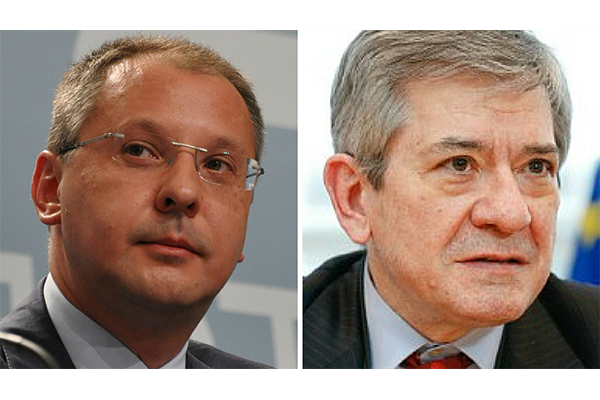 Enrique Baron Crespo and Segei Stanishev are vying for the leadership of the Party of European Socialists. The only challenger to Stanishev is at the moment Spain’s Enrique Baron Crespo, who was President of the European Parliament between 1989 and 1992. Speaking to a small group of journalists, before presenting his candidacy to the Presidency, Baron Crespo, a member of the Spanish Socialist Workers’ Party, vowed to pursue the fight to create a real progressive alternative to the current conservative status quo in Europe. “We are witnessing increased political disaffection towards traditional parties and politicians,” said Baron Crespo, pointing to the decline of the number of affiliates and a low electoral turnout in last year’s European elections. “The erosion of consensus is not the end,” he told EURACTIV, promising the modernisation of the party. In his 10 pledges to modernise the progressive political movement, he promises to create an election campaign fighting machine that is fit for purpose. The permanent Campaign Unit will seek to share innovative practices and place electoral tools at the disposal of member parties for every national, regional and local elections. Social democrats have lost ground in a number of countries, and in recent elections in Poland and Spain, voters expressed disapproval of their respective political establishments. To analysts and campaign planners alike, the profound transformation of party systems in the post-divided and pre-federal Europe still remains a puzzle, with too many pieces. It has become evident that traditional party structures are withering away everywhere, often in slow motion, instead of an implosion like the state parties of the former Eastern bloc. The intellectual troubles, however, have to do with what will replace these structures, according to Josef Janning at the European Council on Foreign Relations. Baron Crespo refuses to concede defeat, and promises to work towards regaining the trust of citizens, “consolidating our base and opening other political spaces in every country”. He intends to hold a PES Convention in 2016 to offer an alternative and take the lead in launching issue-based campaigns, grounded on progressive policy priorities, such as the Financial Transaction Tax, the Youth Guarantee, and the mutualisation of debt. “In every society the point is to conquer the middle classes,” he insisted, noting that even the anti-establishment Spanish party Podemos, despite its left-wing hat, is lured by the Danish model of social democracy, not communism. Like Baron Crespo, Stanishev also wants to modernise the party. One wonders why he has not done, it since he has been at the helm of the PES for the past three years. “He has managed the Spitzenkandidaten process and Martin Schulz’s campaign,” said a source, asked what Stanishev had done successfully in the past mandate. That might not be enough to make him win the race for the presidency. But insiders admit that the game is fixed, and even though a group of countries will vote for Baron Crespo, Stanishev would in the end win the race. Stanishev, who was Bulgaria’s premier between 2005 and 2009, is charged with losing documents containing state secrets. If found guilty, Stanishev, who was elected President of the PES in 2012, but had taken the job already in 2011 when his predecessor, Poul Nyrup Rasmussen, stepped down on short notice, could face a two-year jail sentence, or a fine. Prosecutors accused Stanishev of “losing seven documents between November 2005 and September 2009”. The documents were handed to the former prime minister to sign, but were apparently never handed back by Stanishev, the prosecutors allege. The Presidency of the Party of European Socialists (PES) agreed to organise the next PES Congress in Budapest, Hungary. Meeting at the PES Headquarters in Brussels, the Presidency members decided that the presence of the PES family in Budapest will be crucial as a pillar of support for all the Hungarian citizens who fight for greater democracy and the respect of human rights in the country, including the PES member party MSZP. The PES has repeatedly denounced the erosion of democratic standards by the conservative FIDESZ government, with PES President Sergei Stanishev stating that; “Hungarian democracy is under siege”. Over the last years, media censorship, controversial Constitutional changes and attempts to criminalise the legitimate political opposition have been the alarming consequences of the authoritarian rule of Prime Minister Viktor Orbán. PES Women President and Hungarian politician Zita Gurmai added her voice to the chorus of protests, saying that socialists “will not accept this authoritarian regime in the heart of Europe”.